ZEE Entertainment Enterprise Limited's No. 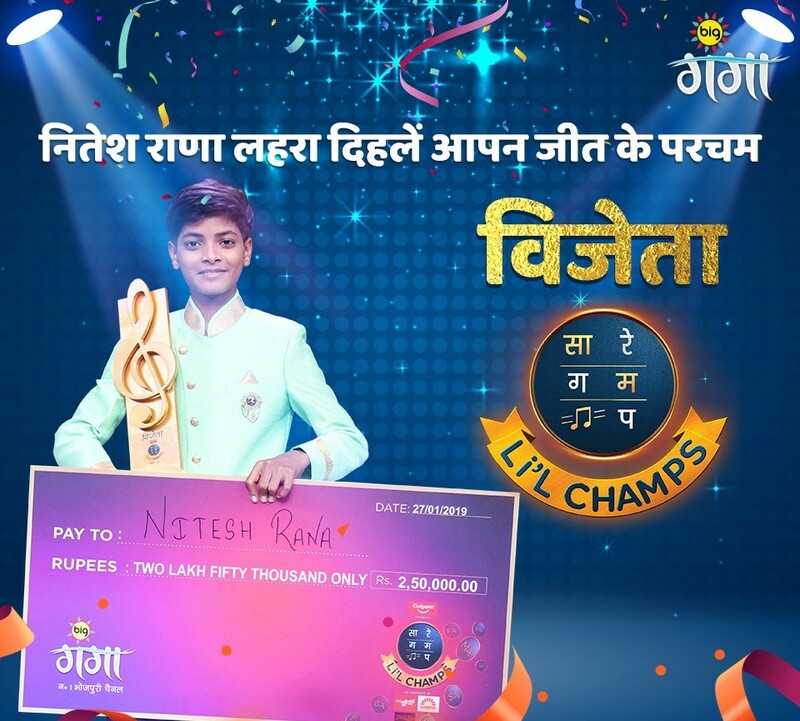 1 Bhojpuri Channel, Big Ganga's talent hunt show for kids Sa Re Ga Ma Pa Lil Champs crowned the winner of its first season - Nitesh Rana from Balia, UP in a high voltage performance laced grand finale. 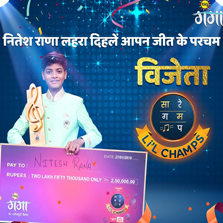 Nitesh, also known as Bholu Raja is the youngest in his family, was awarded with the cash prize of Rs. 2.5 lakhs along with a scholarship from Sunrise foods worth Rs. 1 lakh. The finale of the show was upped in terms of its entertainment quotient with the participation of top Bhojpuri celebs viz. Dinesh Lal Yadav "Nirahua", Anjana Singh, Madhu Sharma, Shyamli, Vinay Anand and Amrapali Dubey, making it a memorable evening for everyone. The participants went through weeks of stringent levels of assessment and multiple rounds to prove their mettle and claim the title. Tusha Banku, the 13 years old contestant from Gonda, UP was announced as the 1st runner up and was awarded with the cash prize of 1.5 lakh. Suraj Kumar from Chunnar U.P was announced as the 2nd runner up with a cash prize of Rs. 1 lakh and Suryanshu Mishra from Ara, Bihar who was also popularly called as Bullet Raja on the show, received the title of the 3rd runner up with a cash prize of Rs. 51,000. Throughout the show, contestants were mentored by some of the best-known names of the industry like Manohar Kumar, Rini Chandra, Mamta Raut and Vikas Tiwari who guided each one of them and helped them further polish their skills. All these mentors are not only deep-rooted artists but well-known Bhojpuri singers as well. The show was hosted by popular actor and famous television personality, Ravi Kishan. Renowned lyrics writer, music director and film director from Bihar- Vinay Bihari along with Megha Sriram Dalton, the folk singer & Coke Studio Artist and Aishwarya Nigam, Bollywood playback singer & winner of Sa Re Ga Ma Pa 2006 graced the Maha Judges panel and presented the final winner of the region. Over the last few years, there was no platform available for kids in the region to showcase their singing talents, BIG Ganga broke the norm by offering one of the biggest singing platforms for to the deserving talents. The show became the talk of the town and received immense love and support from the viewers.